Title: Active Colloid at a Fluid Interface. When: Tuesday, June 05, (2018), 12:00. Speaker: Álvaro Domínguez, Atomic, Molecular and Nuclear Physics Department, Universidad de Sevilla, Spain. The last years have witnessed the growing interest on active colloids, i.e., of colloids made of particles that exhibit chemical activity: this activity induces gradients in the ambient fluid and thus drives a self-induced colloidal dynamics. This kind of systems have attracted attention both as a paradigm of nonequilibrium physics and for its potential applications. In this talk, I will present recent theoretical work focused on a monolayer of active colloid formed at a fluid interface. A new phenomenology arises which is exclusive to the combination “activity + interface”, because the interface is also responsive to chemical gradients: the spatial variations of the surface tension induce Marangoni flows in the ambient fluids that manifest themselves as an effective interaction between the colloidal particles and between these and the interface. At the mean-field level, this interaction is analogous to two-dimensional Newtonian gravity. A particularly interesting result is the existence of “pseudoequilibrium” particle distributions in the monolayer describing the Marangoni-induced coexistence of thermodynamic phases. I will finally discuss the experimental evidence and the feasibility of observing the theoretical predictions. H. Masoud and M. Shelley, Phys. Rev. Lett., 2014, 112, 128304. A. Dominguez, P. Malgaretti, M. N. Popescu and S. Dietrich, Phys. Rev. Lett., 2016, 116, 078301. A. Dominguez, P. Malgaretti, M. N. Popescu and S. Dietrich, Soft Matter, 2016, 12, 8398b, 8406. A. Dominguez and M. N. Popescu, arXiv:1804.01451. Title: Velocity Gradient Power Functional Theory for Brownian Dynamics. When: Wednesday, November 27, (2017), 12:00. Speaker: Daniel de las Heras, Theoretische Physik II, University of Bayreuth, Germany. Power functional theory is an exact generalization of equilibrium density functional theory to nonequilibrium Brownian dynamics. We present an explicit and simple approximation for the superadiabatic excess (over ideal gas) power functional based on the local velocity gradient. The resulting superadiabatic forces, obtained via functional differentiation, are beyond dynamical density functional theory and explain a broad range of phenomena such as viscous forces, lane formation in colloidal systems, and shear migration. Speaker: PauloTeixeira, Instituto Superior de Engenharia de Lisboa, Instituto Politécnico de Lisboa and Centro de Física Teórica e Computacional da Faculdade de Ciências da Universidade de Lisboa, Lisboa, Portugal. We investigate the liquid-vapour interface of a model of patchy colloids. This model consists of hard spheres decorated with short-ranged attractive sites (“patches”) of different types on their surfaces. We focus on a one-component fluid with two patches of type A and nine patches of type B (2A9B colloids), which has been found to exhibit reentrant liquid-vapour coexistence curves and very low-density liquid phases. We have used the density-functional theory form of Wertheim’s first-order perturbation theory of association, as implemented by Yu and Wu , to calculate the surface tension, and the density and degree of association profiles, at the liquid-vapour interface of our model . In reentrant systems, where AB bonds dominate, an unusual thickening of the interface is observed at low temperatures. Furthermore, the surface tension versus temperature curve reaches a maximum, in agreement with Bernardino and Telo da Gama’s mesoscopic Landau-Safran theory . If BB attractions are also present, competition between AB and BB bonds gradually restores the monotonic temperature dependence of the surface tension. 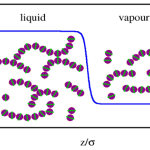 Lastly, the interface is “hairy”, i.e., it contains a region where the average chain length is close to that in the bulk liquid, but where the density is that of the vapour. Sufficiently strong BB attractions remove these features, and the system reverts to the behaviour seen in atomic fluids. We next show that the non-monotonic temperature dependence of the surface tension and interface thickness in this model can be qualitatively reproduced by a local, square-gradient type DFT, with a density-dependent prefactor. This simpler theory is then applied to colloids decorated with two patches of type A and ten patches of type B (2A10B colloids), and interactions chosen so as to exhibit a closed-loop phase diagram when only AA and AB bonds are present . In this case, the surface tension goes to zero at both upper and lower critical points, with a maximum at some intermediate temperature. As BB attractions are gradually switched on, the lower critical point disappears and the surface tension vs temperature curve acquires a very deep minimum at a temperature lower than that of the maximum. On further increasing the strength of the BB attractions, both the minimum and the maximum disappear and the surface tension becomes a monotonically decreasing function of the temperature, as in atomic fluids. The very low surface tension at the minimum for weak BB attractions, combined with the ability to form physical gels, suggests that 2AnB colloids might be exploited as temperature-controlled surfactants and foam stabilizers . Y.-X. Yu and J. Wu, J. Chem. Phys. 116, 7094-7103 (2002). A. Oleksy and P. I. C. Teixeira, Phys. Rev. E 91, 012301 (2015). N. R. Bernardino and M. M. Telo da Gama, Phys. Rev. Lett. 109, 116103 (2012). N. G. Almarza et al., J. Chem. Phys. 137, 244902 (2012). P. I. C. Teixeira, Coll. Surf. A 14, 63-68 (2017).